See Supported Metrics for a list of data that this sensor potentially can show in dedicated channels. Requires access rights for CloudWatch queries. For details, please see the Knowledge Base: How do I define access rights for Amazon CloudWatch queries? For details, please see the Knowledge Base: How much does Amazon charge for using the CloudWatch API? Important notice: Currently, this sensor type is in beta status. The methods of operating can change at any time, as well as the available settings. Do not expect that all functions will work properly, or that this sensor works as expected at all. Be aware that this type of sensor can be removed again from PRTG at any time. 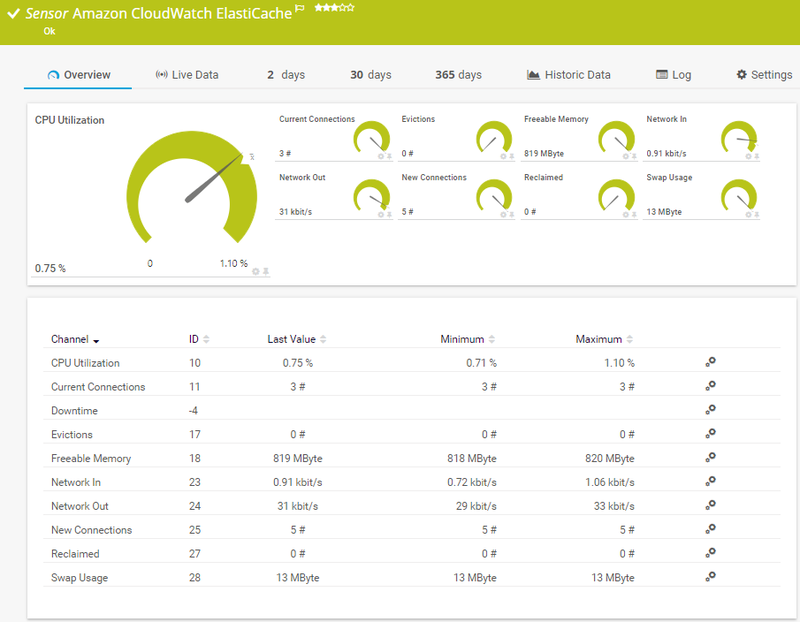 The AWS Identity and Access Management (IAM) account that you use with the Amazon CloudWatch sensor needs specific rights to query any metrics. For details, see section More. PRTG looks for available instances. Note: This can take up to several minutes. Select which service instance(s) you want to monitor. PRTG creates one sensor for each instance you choose in the Add Sensor dialog. The settings you choose in this dialog are valid for all of the sensors that are created. Select the Cache Clusters or Cache Cluster Nodes you want to add a sensor for. You see a list with the names of all items which are available to monitor. Select the desired items by adding check marks in front of the respective lines. PRTG creates one sensor for each selection. You can also select and deselect all items by using the check box in the table head. To better find what you want to monitor, especially in large tables, use the search function in the upper right corner. Discard result: Do not store the sensor data. Store latest result: Store the last result of the sensor to the \Logs (Sensors) directory after each sensor scan. The file name is Result of Sensor [ID].txt. PRTG will override this log file with each scanning interval. You can use it for debugging purposes. For information on how to find the folder used for storage, see Data Storage section. Note: You can find the log file on the remote probe system if the sensor is running on a remote probe, and on the Master node, if you run a cluster. Note: This sensor type has a fixed minimum scanning interval for performance reasons. You cannot run the sensor in shorter intervals than this minimum interval. Consequently, shorter scanning intervals as defined in System Administration—Monitoring are not available for this sensor.